When I lived in London and then Arizona, it never occurred to me that I should prepare my car for winter. Then I moved to North Yorkshire and quickly found that here, winter driving can be a hazardous and expensive experience. I have watched cars slipping, sliding and smashing in the snow and ice. 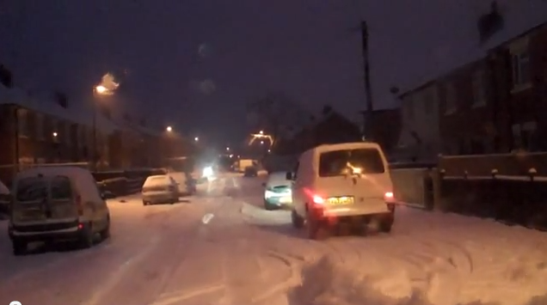 It doesn’t help that when the snow falls, our county council never clears the residential streets. I took that picture above when setting off for work one December morning. The snow is bad enough but when it begins to melt, the roads turn into ice rinks. Up here, autumn and winter are also marked by weather of the windy, wild and wet – very wet – variety. On more than one occasion, when I drove a small automatic, flooding on the roads shorted my electrics. My neighbour Colin recently complained to me that the wet roads a few weeks ago had seen off his much-loved Honda: despite his best efforts, water got into the engine and the insurance company decided to write off the car for a nominal sum, rather than repair it. (A downside of driving used cars, I have found.) Having had to invest in a replacement car, he is out of pocket – and utterly narked. Just last week, when Yorkshire was hit by flooding again, driving to work was like going on the log flume at Alton Towers. I even passed an abandoned, half-submerged car on my way in. Make sure you travel with a charged mobile phone. If your brakes aren’t as good as they could be, for goodness’ sake get them seen to! Check your tyre treads. The AA recommends a minimum tread of 3 mm for winter. Check your tyre pressure. When they are at the correct pressure level, tyres are better at gripping the road. Check your fluid levels. Windscreen wash should be topped up regularly during the winter. If you use the concentrated stuff, make sure that it is diluted to the correct level, so that it doesn’t freeze. The same goes for your engine coolant. Note that when antifreeze gets old, it becomes ineffective. If you aren’t automotively-minded, get yourself to one of the many garages offering winter checks. For example Evans Halshaw (who have partnered with Miss Thrifty to bring you this post, so here’s an extra shout-out for them) check fluid levels, brakes, the exhaust, steering, suspension, heating and ventilation, lighting, wipers and tyres for a modest £19.99. Salt. For the same reason. At supermarkets, you can pick up 750g tubs of table salt for less than 30p. Hi-vis vests. I know this might sound OTT. We bought hi-vis vests from Amazon before we went to Brittany in August, because in France, they are legally required for drivers and passengers. I have kept them in the car ever since; having seen them in use, I think they are a really good idea. If your car is brought to a juddering halt at night or on a particularly busy road and you have to leave the vehicle, other drivers can spot you far more easily. 3. When it snows, double your journey time. Two reasons. The first one is obvious: when the weather is extreme, it takes longer to reach your destination. The second reason is even though you may be hurrying to get to work, it will take longer to get your car road-ready in the morning. If it has been snowing hard and your car isn’t kept in a garage overnight, you may need to dig around or put some salt down so that you can move off. 4. Don’t think that because you are in a big car, you are protected from the elements. Unless it’s a four-wheel drive, a big car can lead to a false sense of security. I don’t have any scientific data to back this up, but it’s my personal experience – watching drivers of oversized vehicles going bonzo on the roads around here every winter. Watch them aquaplane! Dodge them as they slide gracefully from one side of the carriageway to the other! Actually, the best car I’ve ever driven in the snow was that little automatic: the toytown-sized tyres, with their narrow width, cut through the snow and ice brilliantly. The cars with big tyres and rear-wheel drive, which include a lot of BMWs and Mercs, seem to have a more difficult time of it. Again, this is just my experience – I’m no Jeremy Clarkson. But I note that in the snowy parts of America, where winter tyre fittings are commonplace, motorists are advised to downsize their wheels at the same time. Reduce your speed, to reduce your chances of skidding and crashing. Remember that your stopping distances are up to ten times more than they would be in normal weather. Keep your distance from other vehicles. Try not to brake, accelerate or turn corners suddenly. Try not to brake when turning corners. This includes roundabouts. The centrifugal force pulls your vehicle outwards, and if your wheels aren’t gripping the road very well your car can go into a slow, horrible spin. Brake gently, and in a low gear. If you begin to skid, sudden braking is a no-no. I know it sounds like an obviously dumb thing to lock your wheels at the worst possible moment… but people panic. Instead, steer into the skid and gently accelerate. There are some great tips from a Colorado winter driving instructor here. If in doubt about the depth, don’t drive through that giant puddle covering the roadway. On this occasion (below) I decided to seek an alternative route. Yes, those are ducks on the right. 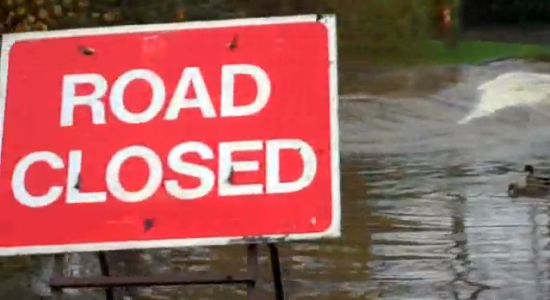 If you do drive through a giant puddle, try to keep away from the kerb, where the water is often deepest. Low gear, high revs, slip the clutch. This helps to stop water entering the exhaust. Keep your distance from other vehicles. This is because on wet roads, your stopping distances can be twice as big. Also, you don’t want to be close to vehicles that are throwing up large amounts of water. Oh, and if you drive a little automatic, like I did, shorting the electrics isn’t the end of the world. As the engine phuts to a fizzle, pull into the side of the road and employ your kit (above). Wait 15-20 minutes for the water to dry out. 7. Take out breakdown cover, or risk financial extortion and abject despair. If you find yourself stranded by the side of the road at night, cold and with horrible weather howling around you, one thing is guaranteed: when the AA/RAC/Green Flag angel comes bobbing over the horizon in his or her van, it will be illuminated with a saintly golden glow and you will be humbly, extraordinarily, pathetically grateful to be rescued. Yes, the annual premiums can be expensive – but if you have ever called for roadside assistance, you will know that they are worth every penny. Up until now I’ve been a loyal customer of the RAC, who give me the equivalent of a no-claims discount every year, reducing my premiums. But from next year I’m going to renew or swap provider using Quidco, which offers some handsome cashback rates: up to £85 on RAC cover, up to £70 cashback on AA cover and up to £50 cashback on Green Flag. Evans Halshaw: first for new & used cars, servicing and motoring advice.